There are many questions we get on a daily basis in emails, calls, and drop ins, but a question arriving with greater regularity is “is it safe?”. A fair question, and one worth asking. While development spurs strong response, and leaves some residents with concerns about parks and environmental issues, others with transportation queries, the physical safety is a cross-over unease that permeates many interests. While the City has several checks and balances in place to keep the metropolis running, things slip through the cracks. As part of our #votersagainstsupertalls tagline we are launching #isitsafe to examine developments not just on the Upper West Side, but citywide and beyond as the race for the sky on every shrinking footprints never seems to abate. Case in point is 161 Maiden Lane. 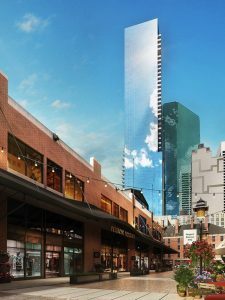 As detailed in GOTHAMIST and CURBED, the New York Post, the Commercial Observer, 6SqFt, The Real Deal, and Business Insider, this recently constructed 670-foot, 58-story tower is already leaning 3″ due to faulty foundations. 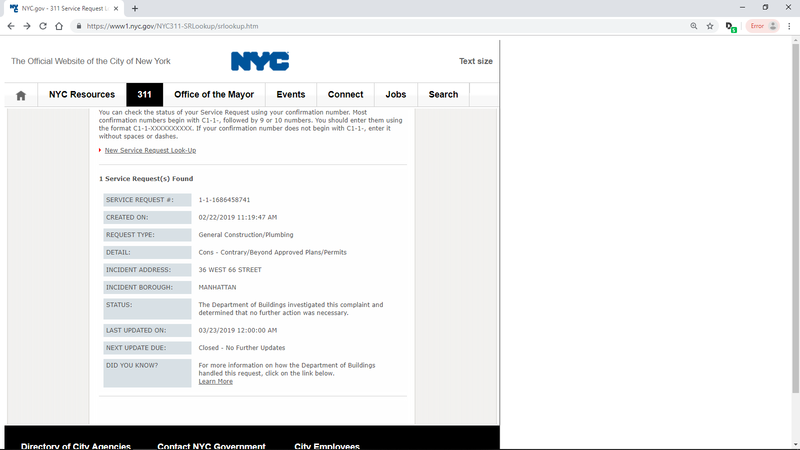 Now, although the City does inspections, foundations permits are among the easiest to obtain and amend, case in point is 36 West 66th Street which filed a building on four merged parcels on the south side of 66th Street but is building a through block foundation to 65th street that is even wider than the initial limit. Although it does not conform to the permits filed, the DOB didn’t seem concerned. As the contractor and the owner for 161 Maiden Lane, (aka the Seaport Residences) argue in court, the City is host to a leaning tower. Oftentimes, the threshold for a project to be vested is if the foundations are complete, putting unnecessary pressure on this integral part of a structure. Whether it is to get them done before acknowledging what is really intended for the site, or just carelessness, thrift, and ineptitude (not accounting for the soil settling)–all accusations made in this instances according to reports, it still leaves the surrounding community at risk. Those risks can take many forms, as evidenced previously by SCC High Rise Construction, a concrete subcontractor which previously plead guilty to second-degree manslaughter for a workers death on this very job site. As both sides await a judge, what about those on the outside? The public. Who is minding the shop, or most importantly, who is minding us?